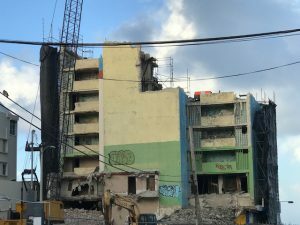 Later, when we return to our area, we walk over to the Condado Vanderbilt, an elegant turn-of-the-century hotel that’s been completely redone—a sunken bar area of velvet settees, dark wood, and sleek statues. But it is utterly empty—the lounge area, the bar, where the staff wait expectantly; the restaurant and the terrace where the ocean pounds below. 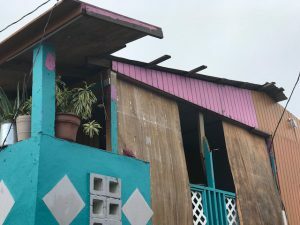 The next morning we take an Uber to a nature preserve in Cataño, an industrial area with small homes perched on concrete pillars, huddled in narrow alleys. 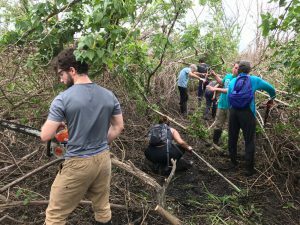 We’re here to help out Luis Marrero, of Cara Con Causas, who leads many programs, particularly the nature preserve area. The area, which was once mostly covered in mangroves, was filled in during the industrialization period, when migrant workers came and settled. It’s unfortunately become something of a dumping ground too, filled with concrete and garbage—I noticed an entire couch sitting in a channel of water as we were driving up. 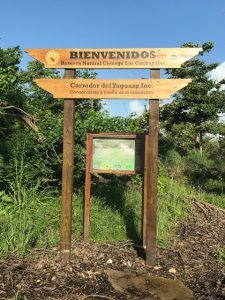 Luis and his organization use this are not just for reforestation but as an education center for young people and the community. Today our aim is to clear out the paths and then later do some planting of the mangroves. Fallen gray trunks and branches are stretched across the path. We attack them with shears, an axe, a saw and a chain saw. But it’s long hard work in the mud and heat. Rafi, 13, finds it overwhelming. But we keep at it—snipping, sawing, chopping, raking the ground after, and after a while, we’ve succeeded in clearing one turn in the path. Then we move on, where more trees have fallen across and we’re at it again. After several hours, with pauses to drench ourselves in bottled water or munch on bags of plantain chips, we have managed to do some decent clearing. We’re all exhausted so there’s no chance today of planting. 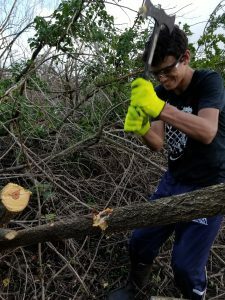 But Rafi has learned to use a saw and Sasha has let that axe fly (a little too high near his head for this mother) and we’ve also met others who have come to the island to volunteer. There’s a young woman, Meredith, who has a PhD in organizational science and is here for several weeks, trying to help the various organizations communicate and work with each other better. We work alongside Raul, originally from Puerto Rico, now getting his masters in accounting at the University of Michigan, and two college students from D.C., who have just come from helping to lay the foundation of a basketball court at a school, about thirty miles away. One senses a chain of these individual volunteers, throughout the island, learning of needs in an ad-hoc, word-of-mouth way. After, we sit with Luis and he tells us more of his efforts. This area, he explains, is the poorest neighborhood on the island, and highly toxic, since there is an oil refinery nearby. I had heard that the poverty rate on the island is 40%–he says it’s closer to 50% and 57% of children live below the poverty line; by the age of 20, half of all women have children. So the cycle of poverty is hard to break. 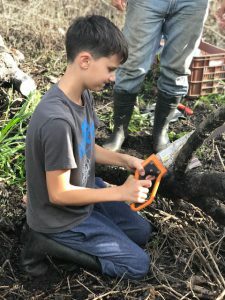 Thus, his work is not just ecological—he brings in volunteers to meet with the children so they can envision lives beyond this area; they’ve adopted a school where they hope to provide a better education; and he hopes to employ more in the neighborhood in the actual preserve. 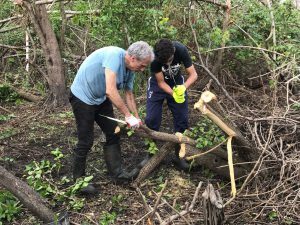 I mention that with only one chain saw it’s going to take him forever to clear this mangrove area. He agrees. Most of his equipment—shovels, rubber boots, which he keeps stowed in the patio area of another house—were oriented to planting and regrowth. But the hurricane has changed all that. 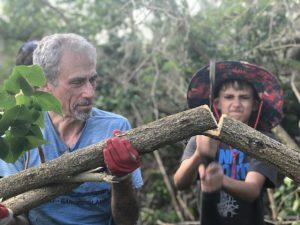 So we agree that perhaps one thing we can do is see about raising money to purchase a few chain saws so that the work can be more efficient—and he might be able to employ some locals in the community. We return to his house, muscles aching, just as the skies break open again with the warm, pattering showers that are so common. A young boy comes onto the patio, and after, Luis tells me that his family’s house was completely lost in the hurricane. Only recently were they given a new home, and Luis was able to get them furniture from a family that has left Puerto Rico. 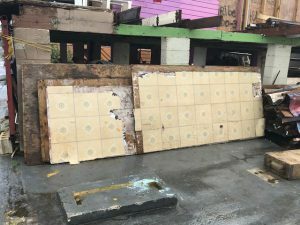 Down the street, we see a gaping spot where a house once stood—a thin sheet of wood covered in old linoleum is leaned up on the side. The house next door has no roof, its back portion exposed to the beams. Further down the alley a house is being rebuilt with fresh concrete steps and paint, but most of the homes have a shaggy, tacked-together quality. 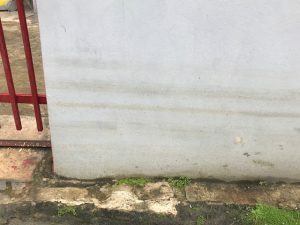 Along the alley wall, one can see a brown running stain—a good two feet where the water reached. On our way back to the hotel, we take an Uber to Lote23, yet another hip outdoor eating place of food trucks and refurbished Airstreams. 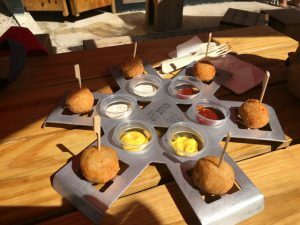 We have luscious croquettes with dipping sauces, poke bowls, blood sausage and beans and rice, an Asian noodle bowl. “It’s like we’re in San Francisco,” Rafi says. 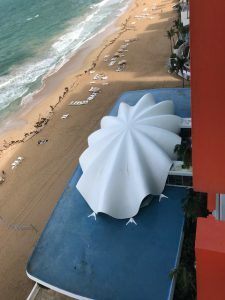 Then we spend a few hours at the hotel, resting by the pool, which is much more full with families, a mix of Americans, or those with Puerto Rican roots, squeezing into the hot tub and chatting over glasses of wine. 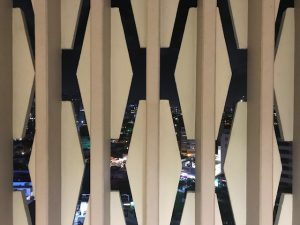 A few minutes after the boys go back up to the room, I receive a cell call: they’re stuck in the elevator between floor 7 and 8 and the emergency call button isn’t working. So I rush to the lobby—after many walkie talkie calls the engineer is able to pry open the doors on floor 7 and they hop out. It’s one of the hazards of staying here right now—the manager explains to me that the elevators do need more maintenance and they are awaiting parts. One understands and forgives this, along with the items that may not be on a menu, or the traffic light that does not fully function. 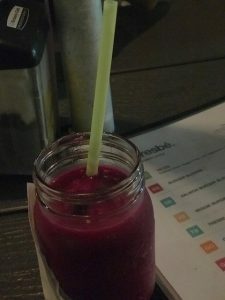 That night, since Rafi needs to sleep, we go to eat at a chic restaurant around the corner—Mario Pagan. It has a sleek, almost Scandinavian look; an aquarium-like window floats in the back, made of repeating Y-shaped branches. The food is exquisite—a terrine of shaved Brussel sprouts with beets and bacon; crispy pig’s ears (which I can’t bring myself to eat); red snapper over creamed Israeli couscous. And a dessert of chocolate soufflé sprinkled in sea salt. Later, we stop in at a local and popular Chinese restaurant, which is teeming and loud, for dumplings for Rafi. And then the lobby is a cacophony of music—a musical group dressed in black suits are playing old favorites—and everyone is dressed up, singing along, dancing. It seems impossible that just hours ago we were wading in the mud next to one of the poorest (and environmentally polluted) areas on the island. But what one feels here, in a concentrated version, are all the layers and stark inequalities of this island. There are times when we could be in any upscale hip city—San Francisco, New York, Mexico City—with the same relaxed sense of style and food. The balmy weather—gentle breezes that blow in every evening and make it lovely to walk in these canyons of white buildings—seem to soften the damage. And yet it is a fragile illusion. 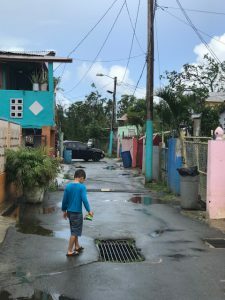 Puerto Rico exemplifies the state of the world right now, just in distilled and exposed form: shocking poverty alongside comfortable, cosmopolitan ease. Having just witnessed the voting in of a U.S. tax bill that will only exacerbate our inequality, the island feels uncomfortably familiar. We are Puerto Rico, too. 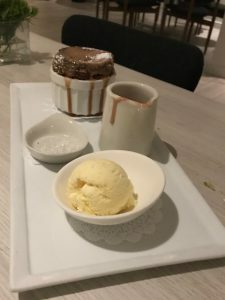 Fascinating and so strange this luxury and luscious food and chocolate soufflés. So unexpected. Seemingly only glimmers of disaster. Where to place stories of three months without electricity. Of supplies that don’t reach the neediest. Of the years it will take to repair this island. Interested to read more. Good work, Rafi and Sasha! Marina — Sounds like a great way to give Christmas — good work, and love to you and your family.